I do like scenic covers, so I would design it with a familiar landmark from the setting like skyscrapers for NYC or the Golden Gate Bridge for San Fran. I'm a fan of the Destiny series, so I'm definitely looking forward to finding more about Duke and Anna. My favorite Destiny couple is Mike and Rachel. I like the opposites attract theme and they start off on the wrong foot. Jane, I just finished reading an ARC of Half Moon Hill. It's wonderful! I think you're really going to enjoy Anna and Duke! I haven't read this series yet but this story sounds like a good one. Maureen, it's a wonderful series. I hope you give it a try. I would definitely recommend reading the books in order as each one builds on the one before it. Here's the order: One Reckless Summer - Sugar Creek - Whisper Falls - Holly Lane - Willow Springs - Half Moon Hill. I love Toni and this series. The cover is great. I like colorful cutesy covers - ones with a cozy looking home. Also like the ones with head missing - strange, I know. It is so hard to choose favorites - by Mick (bad boy) and Jenny from One Reckless Summer are one fav couple. I love Mick and Jenny! They are one of my favorites. Love this series. My favorite was One Reckless Summer. Loved Mick & Jenny's story. I like "scenes" for covers. Nothing is more frustrating than a cover of a gorgeous blonde heroine in a clutch with the hero, but the book describes the heroine as brunette. Love to win a copy of the new book. Thanks!! This series has some beautiful covers, doesn't it? The cover of One Reckless Summer is a favorite of mine, probably because it reminds me so much of the summers of my childhood. Love that cover! The cover is lovely. A cover that is appealing shows a town nestled in the mountains. My favorite couple is Milk and Jenny. thanks for this great post today. I'm a Destiny fan too, PJ. 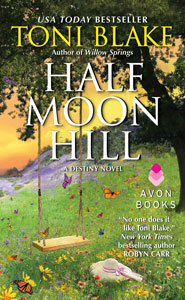 In fact, I posted my review of Half Moon Hill today. I agree that all the covers have been gorgeous. I think Sugar Creek is my favorite cover and my favorite Destiny story. I loved seeing Rachel and Mike's HEA in process in Half Moon Hill. A cover that reflects the story is important and one that I enjoy seeing is the main street of a small town. This series sounds wonderful. Country scenes are always beautiful. I'm afraid I've read Toni but she is another author that I've heard good things about. I think the cover is lovely! Oh I should proofread my writing - I'm afraid I haven't read her - goodness, that sounded terrible, forgive me. I love this cover and do not like when there is nothing in the story that is depicted by the artwork. I love Toni's books and love seeing a nice landscape scene. Toni is one of my go-to authors. I have been waiting for this one. The cover is stunning. One Reckless Summer was my favorite. I think I read about four of them and then stopped with the series. Have not read any of these but would like to get started. Oh, the covers I usually like are the ones with a naked torso! But the scenic ones are nice, too! LOL! Looking forward to reading this. The thing I love most about TRD is that it is always introducing me to authors I have not read yet. Thanks for the lovely intro the your new release, Toni, I think I would buy it based on the gorgeous cover alone! Thanks again! I'm super excited about this book's release! Hi, Toni - glad to see you here - love your books. Please keep writing those wonderful contemps. Seeing the cover of One Reckless Summer is what made me pick the book up in the first place. I am now a Toni Blake/Destiny addict! Reading this series makes me feel the joy of "puppy love" and my first love again with an adult twist!